Ok, so, predicted as long ago as 1969, the Sunyaev-Zel’dovitch effect (usually known as the SZ effect — because it’s easier to spell) is a distortion effect of the cosmic microwave background (CMB). The universe is filled with microwave radiation (at a temperature of around 3K or -270C). When you switch on the TV and get static, a small amount of the noise you hear is actually space itself! First, take a look at that image up there. 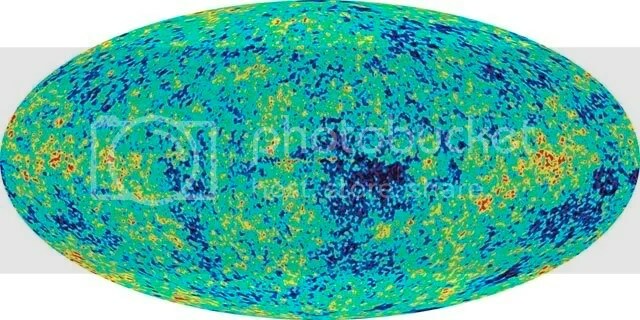 It’s taken by the WMAP satellite and it shows the fluctuations in the cosmic microwave background. Bluer patches are effectively ‘cooler’ and redder patches are effectively ‘warmer’. In other words, the microwave radiation was either lower or higher energy, respectively. Simply put, they’re density fluctuations. Mainly, the SZ effect happens because of energetic (ie hot) electrons interracting with all of those CMB photons. The electrons go through ‘Inverse Compton Scattering’ where they interract with matter and increase in energy. Some of this energy is then passed on to the CMB photons (which are everywhere, after all), effectively making them hotter. Those density fluctuations can be used to find galaxy clusters and all sorts of other things. In fact, they have. Any massive object leaves a fingerprint on the cosmic microwave background radiation, courtesy of the SZ effect. Some massive galaxy clusters have already been discovered this way… In fact, there’s actually a whole array of telescopes dedicated to this very task! Mind you, the SZ effect is only one source of all of those fluctuations in the CMB. Another one is the Sachs-Wolfe Effect (which is one for a different blog entry). The main reason why the SZ effect is useful is that it isn’t affected by redshifts. It appears the same way, no matter how far away it occurred, which for galaxy-heads is extremely useful! This entry was posted in astronomy, Imported from Livejournal and tagged cosmology, galaxies, reading lists. Bookmark the permalink.